RALEIGH – The state has agreed to sell two underutilized sites on the northern end of downtown, which has drawn lots of interest from developers in recent years. A group of developers has offered $4.85 million for a 1.8-acre site on West Peace Street, across from Seaboard Station. A different group has offered $1.75 million for the .5-acre site of an old steam plant on North Dawson Street near the Days Inn Hotel. Both sites are zoned by the city to allow mixed-use development up to 12 stories. “We’ve got a lot of interest in this property just given everything that is going on in the Peace Street corridor,” said Russ Jones, who is among the group hoping to buy the site that currently houses the state’s Personnel Training Center. “It is a dynamic location in a rapidly changing part of downtown Raleigh,” he said. The group hasn’t decided what it wants to build, but the redeveloped site will likely feature retail, office space, hospitality or residences, said Henry Ward, one of Jones’ business partners at Raleigh development firm Loden Properties. Milan DiGiulio, an orthopedic surgeon with an office in Cary, is among the group that offered to buy the site of the steam plant, which is boarded up and has sat vacant since the early 1990s. He said the partners have a plan for the site but want to make sure the deal goes through before sharing details. The Council of State, which is set to meet Dec. 6, must approve the sales. If they go through, the redevelopment will further transform the future of northern downtown. The state Department of Transportation is replacing the Capital Boulevard bridges over Peace Street and Wade Avenue, a three-year project that will reconfigure the street grid. Kane Realty and Williams Realty & Building Co. announced in May it plans to build a multimillion-dollar project on nearly 4 acres of land along the south side of Peace Street stretching from West Street east to just before the Capital Boulevard bridge. Plans call for 400 apartments and ground-floor retail. Harris Teeter announced in July it plans to start construction as early as the end of 2017 on a grocery store in Seaboard Station off Peace Street. Selling the two properties is part of Gov. Pat McCrory’s Project Phoenix plan, which was announced in 2014 and aims to sell some state-owned properties in and around downtown for new uses. The state put the Peace Street site on the market in 2015. The 12 state employees who work in the Personnel Training Center will be relocated to the nearby Dobbs Building, said state Budget and Management spokeswoman Melanie Jennings. Both development groups involved in the recently announced purchases have other projects. 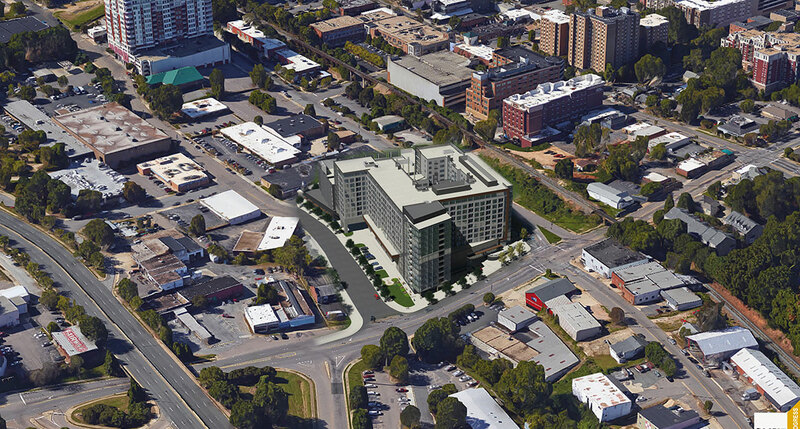 Jones and his group of fellow investors are involved in a $20.2 million deal to redevelop a 3-acre site on McDowell Street where The News & Observer is located. DiGiulio and his business partners bought, and now lease, a commercial warehouse near the corner of East Whitaker Mill and Wake Forest roads.